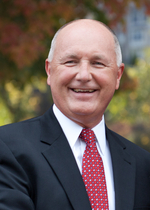 IPT Senior Shillman Fellow Pete Hoekstra is the new United States ambassador to the Netherlands. The U.S. Senate approved his nomination in a voice vote Thursday. 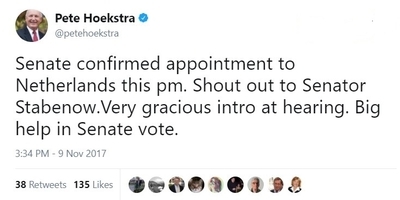 Hoekstra, a former nine-term member of Congress, is a Dutch native who lives in Holland, Mich. He served as the House Permanent Select Committee on Intelligence chairman from 2004 through January 2007 and as the committee's ranking Republican until leaving office in 2011. Despite the highly-charged partisan environment in Washington, Hoekstra's nomination was supported by both Michigan Senate Democrats. "I know he is well suited to serve our country in this new role as Ambassador," said Sen. Debbie Stabenow. "I was proud to serve with Pete in the House of Representatives, and this nomination is a great opportunity for Pete to continue his service on foreign policy issues," said Sen. Gary Peters. Hoekstra joined the IPT as Senior Shillman Fellow in 2014. He focused on the evolving and growing threat or Islamist terrorism, building on the expertise he gained leading the House intelligence committee. "It has been a wonderful experience to work with Steve Emerson and the IPT team," Hoekstra said Monday. "They have and continue to be the forefront of understanding the threat from radical Islam and keeping America safe." He expects to present his credentials to the Netherlands' government around New Year's. Known for his boundless energy and positive approach, Hoekstra also helped the IPT enhance its profile and keep supporters informed. He appeared often on television news programs, discussing terrorism, national security and other significant issues. Last year, he crunched data on global terrorist attacks to show the exponential growth in deadly Islamist violence throughout the world since the 9/11 attacks in 2001. The killings especially skyrocketed – increasing nearly 800 percent – as ISIS emerged as a force. The analysis showed how Islamist terrorists used broken states like Syria and Libya to drive the bloodshed. The safe havens allowed terrorists to perfect attacks that are more efficient and more lethal. His article correctly predicted that Africa would be the next growth market for jihadists. "The statistics are frightening and they are clear," Hoekstra said at the time. "Africa is a new, emerging battleground for ISIS and the West." An update to that analysis is expected soon. "Our latest analysis will show how the global threat is morphing from a deadly physical caliphate to a dangerous virtual caliphate," he said. "We have been privileged and so proud to have Pete Hoekstra serve in our organization for the last four years," said IPT Executive Director Steven Emerson. "He has been a fountain of unparalleled information on radical Islamic activities, national security and intelligence. His calm demeanor and innate leadership skills in the face of many crises has been instrumental to the IPT's success." In addition to his many contributions, Emerson said, he values his friendship with Hoekstra and notes that "both I and the rest of the IPT staff will sorely miss him. But the U.S. Government is blessed to now have the services of a man whose past contributions to U.S. national security have been monumental and whose service in the future to our country will only make our nation safer."